I know I said I fancied a Blaser R93, but from the same factory there's another rifle. The Mauser M03. Also with interchangeable barrels, but this time it has a conventional bolt throw and a proper drop out magazine. Being the kind of numb-nuts who managed to drop a round into the undergrowth from a high seat I appreciate a drop box. [Yes of course it clanged off a rung on the way down]. Not cheap: but little on the I Want One list of kit lust is. You can wash yourself with an old car washing sponge, a bucket and a length of hose, but dropping a few grand on a nice bathroom changes the ablution experience. After one too many wasted evenings re-installing Windows 98 I flashed up for a Mac book and never looked back. While you're paying a premium for design, you're getting some those well thought out touches that pass the Doh! test and make life a little better. With the Blaser you get a sence of the-rifle-re-thought, with the M03 its more a best of: De-cocking safety - not just blocking the release of the firing pin but taking the tension off the spring - making the rifle inert even with one up the spout, a 'Set trigger' meaning it has two sensitivity settings; one where it breaks at just under 1 lb and on the other setting at just over 4 lbs - less squeeze for still hunting from a high seat with something to rest the rifle on, or more squeeze for greater safety for stalking. Not a light rifle in anybody's book, at almost nine pounds with a scope. But that's no bad thing for still hunting from a high seat, or from a bipod, and gives a nice, fluid, smooth movement when swinging the rifle at a moving boar. Never going to be called a mountain rifle though. Although, already on the website as vaporware: at some yet to be disclosed time in the near-to-distant future there'll be a Dural aluminium alloy action model that's 400 grams lighter - nice! 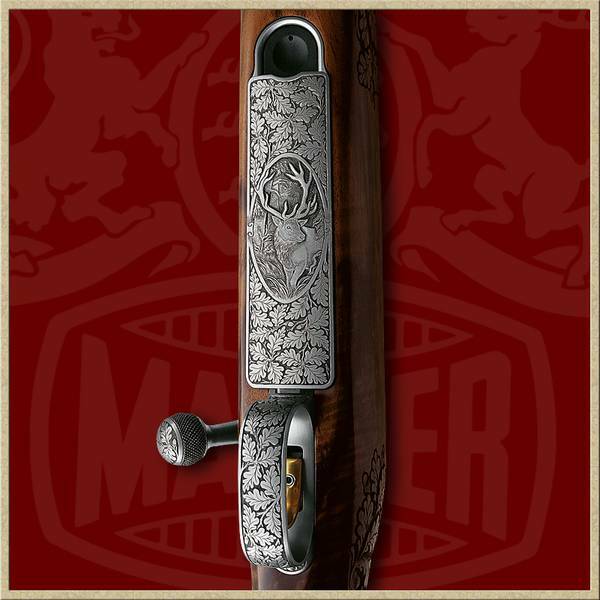 For the steel actions Mauser offer all the finishes you'd expect: coated, coloured, or engraved to the depth of your pockets. 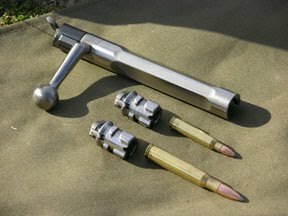 Barrels are available in all the usual caliber's from .222 to 458 Lott. There are two families of barrels 16 mm and 19 mm. Some stocks are only available inlet for the larger pipes. 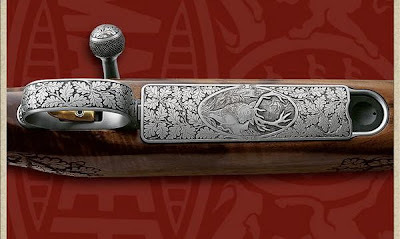 As you'd expect from someone with a name like Mauser to honor the stocks are something to behold, with interchangeable variations offered in the finest grades of old school walnut (priced from 'cold sweat' to 'emergency resuscitation required') and a series of synthetics with a steel chassis. The Stutzen (with a twist - it's a two piece): Two trad european looks for a weekend with Count Jägermeister and Countess Von Jägerin? Or short and to the point - the Trail with an 18 inch barrel for the Battue or as a handy hillside gun for Italy? Come on Santa Baby - hook a Bushwacker up. I've been awful good. Pleeeeeaazzee. The barrel options are listed here as a PDF.